This candy gift basket is perfect for anyone who loves warhead sour candy. When it comes to sour candy, warheads are our top seller. If you have never had a warhead sour candy you are going to be surprise, your tongue will not know what hit it. 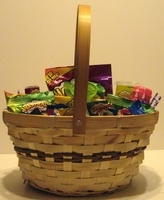 This candy basket is full of nothing but warheads sour treats. You get the following candies. 20 assorted flavors of extreme sour warheads. If you are a lover of warheads sour candies or known someone who is, this is going to make the perfect gift. No matter what the occasion is. Guaranteed to make you pucker up for hours.